TheBlueGuerilla: EXCLUSIVE: Young Tory Candidate Quits London Uni Conservative Race Over Social Media Abuse. 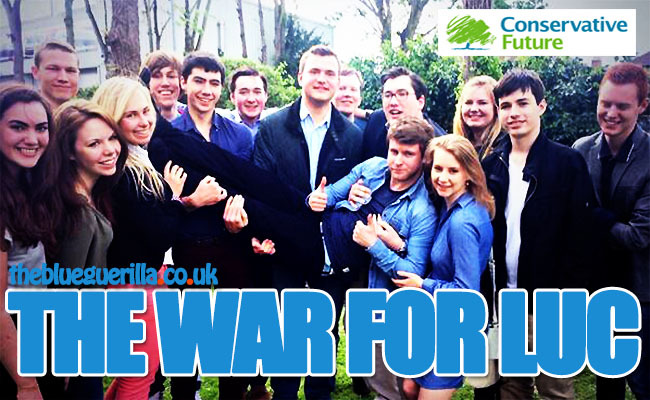 EXCLUSIVE: Young Tory Candidate Quits London Uni Conservative Race Over Social Media Abuse. A CONSERVATIVE PARTY candidate for the umbrella organisation London Universities' Conservatives (LUC) Chairmanship has sensationally quit the race after his opponent, Ben Judge, allies attacked him online with a "deluge of abusive messages" for having a "light-hearted" joke on Twitter, TBG can reveal. The "hounding" of London School of Economics (LSE) Leader and LUC candidate, Josh Hitchens, continued after apparent Kings College London (KCL) committee members discovered a blog post about increasing ethnic minority involvement in the Conservative Party. Criticising the society for inviting the vile & ghastly UKIP'er Godfrey Bloom to talk at a descriptively pompous KCL Tory event. The blog post says - "A University (KCL) ran their AGM slightly differently to ours. Upon entering, attendees were greeted with classical music and a portrait of the queen. The agenda was concluded by the singing of the national anthem. The same association thought it was appropriate to invite Godfrey Bloom to talk, the former UKIPPER who called women at his conference sluts, the third world bongo bongo land and asked a disabled student at Oxford whether he was Richard III." 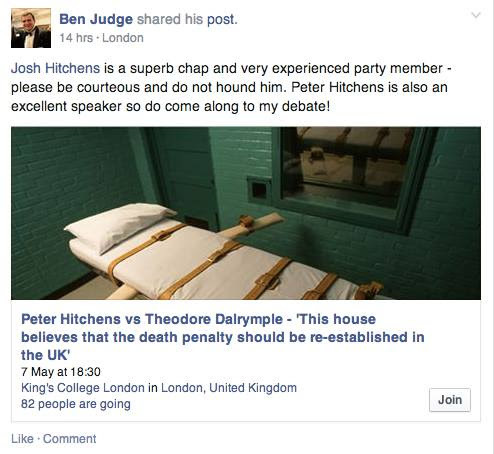 Ben Judge had to rush to stop his colleagues' alleged battering of Josh Hitchens with a status on KCL's Facebook Page. TBG understands many London Tory members were appalled by the behaviour of the KCL committee. Chair' of UCL Conservatives said - "I am extremely disappointed to hear of this sort of activity within LUC. I do hope this won't put you (Josh Hitchens) off running - a bit of competition is good for the organisation and the debate about how we progress. I'd certainly be sad to see you step back in such circumstances, especially when so unrepresentative of the LUC experience as a whole." Sources have exclusively revealed Josh Hitchens response to the attack. TBG can confirm Josh has said - "The whole experience was incredibly distressing. Due to the sheer quantity of abuse and harassment I decided to withdraw from the running's and endorsed Ben hoping that this would cause members of KCL Conservatives to stop what was an intentional and orchestrated campaign of cyber bullying. "I would like to emphasise that KCL Tory Society is an outstanding society and has made great contributions to London University Conservatives as a whole, however this kind of intimidation, abuse and cyber bullying should have no place either in our party as a whole or in student politics. I am reviewing my decision not to stand as it was made in light of an unpleasant and unacceptable personal attack campaign." Standard CF behaviour I'm afraid.